James Fagan Scharnberg, 80, of Malvern, PA, passed away peacefully in his sleep on Sunday, January 27 at Barclay Friends in West Chester, PA. Born February 21, 1938 in Newport, AR, he was a son of the late Oliver H. Scharnberg and Lady Elizabeth Watson. He was the beloved husband of the late Patricia Colladay Scharnberg and the late Marsha Gray Laubenstein Knight-Scharnberg; loving father of Eric Scharnberg (Cristina), Alex Scharnberg, and (stepdaughter) Gwendolyne Knight; adoring grandfather of Olivia and Ayla; dear brother of William Luker (Cindy), and Timothy Watson, Sr. (Betsy); and caring uncle to Timothy, Todd, Leslie, Jennifer, and Andrew. Jim graduated from Yale University School of Art and Design in 1959. He had a long and gratifying career in graphic commercial design, winning awards and naming the Philadelphia area’s first automated bank machine “George” for Girard Bank. He is also credited for having designed the “Victor V” logo that Victor still uses to this day on their ubiquitous mouse traps. He served as troop committee chairman for BSA Radnor Troop 284, with both of his sons achieving the rank of Eagle Scout. Jim was a member of St. Anthony Hall fraternity, the Franklin Inn Club, the Society of Colonial Wars, the Pennsylvania Society Sons of the Revolution, and the Baronial Order of Magna Charta. Jim was widely known in the hunting world as the Master of Basset Hounds for Skycastle French Hounds, the only pack in the U.S. composed of French roughcoated bassets. 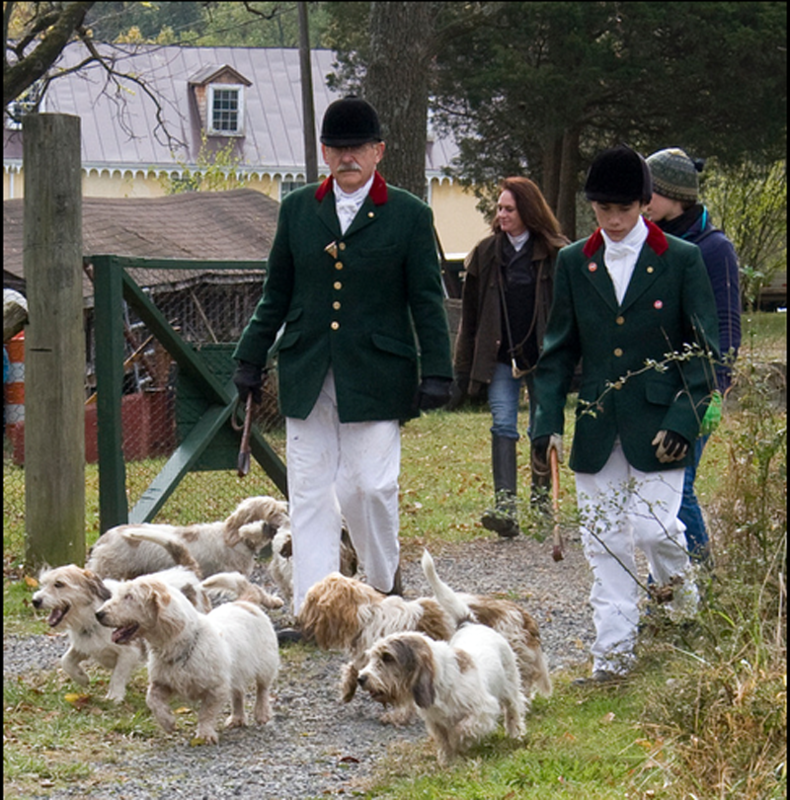 Jim’s interest in the sport began when he hunted with Dr. Anthony Garvan’s Little Prospect Foot Beagles in Spring House, PA. Jim whipped-in with multiple established foot hound packs in the area, including Ardrossan Beagles, and he soon became a key staff member at Skycastle French Hounds of Chester Springs, a basset pack founded in 1948 by John and Elizabeth Streeter. Jim became Master of Basset Hounds for Skycastle in 1987 following Mrs. Streeter’s death. For the past 32 years, Jim has guided the Skycastle pack through the fields of Chester County. Under his Mastership Skycastle exhibited annually at the Bryn Mawr Hound Show and the National Basset Pack Trials in Aldie, VA. Jim was also a fixture at Ludwig’s Corner Horse Show where he and Skycastle sponsored a land conservation tent each year. As Hunt Master, Jim led a devoted cadre of volunteer hunt staff, including many young people, for whom he served as a treasured mentor and friend. A great thrill and highlight in his life were his visits to France in 2017 and 2018 as the guest of several French Hunt Masters, visiting their kennels, exchanging breed information, and joining them on exciting hunts for wild boar. Jim worked tirelessly to preserve open space and advocated in Harrisburg for fair dog, sport hunting and land-use laws, serving on numerous committees and advisory boards providing guidance on dog care and environmental issues to the Governor and Pennsylvania state legislature. He dedicated himself to the responsible breeding of all hounds, but particularly the Petit Basset Griffon Vendeen, or French basset hound, working hard to eliminate genetic issues from the breed and recently received honors from the PBGV Club of France in recognition of his efforts to eradicate genetic eye disease. Over his long and distinguished career as a hunter, he bred, raised, trained, and loved dozens of hounds. In collaboration with many leading Masters of Hounds, Jim’s meticulous organization of many years of breeding records for American beagle and basset packs set standards that serve as highly praised models for the American Kennel Club and other international bodies. For many years, Jim’s wife Marsha played the role of Queen Victoria at the Savoy Company’s Gilbert and Sullivan performances. In later years Jim delighted in playing royal consort Prince Albert alongside Marsha’s regal Victoria. 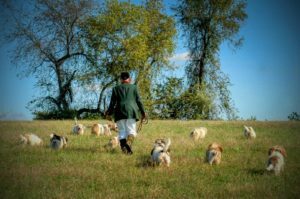 Jim had a great interest in the history of hunting with hounds and amassed one of the finest private hunting libraries in America. 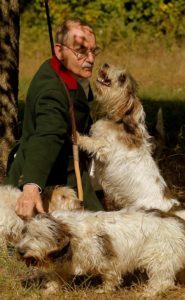 He authored a number of books and articles on hunting, including the “Beagling and Basseting” handbook for hunt staff members that is still widely used. Most notably, he edited and collected a volume of over 100 articles by Sir Newton Rycroft whose writings had significant followings in both England and America. “Rycroft on Hounds, Hunting and Country” took years to compile and edit, and the richly illustrated volume of essays is treasured by many. In addition to his writings on hunting, Jim also published several volumes of poems that celebrated nature’s beauty and outdoor themes. He was also a talented artist and cartoonist. Throughout his life Jim strived to live by the principles of honesty, strong family communication, facing one’s fears and accepting his children and everyone he knew for who they were and on their own terms. As a result of these life principles he was loved and admired by many and will be greatly missed and never forgotten. His memorial service will be celebrated on Saturday, February 23rd at 11AM at St Andrews Episcopal Church, 7 St Andrews Ln, Glenmoore, PA 19343. In lieu of flowers, please send donations in Jim’s memory to Skycastle French Hounds c/o Mr. Barrett E. Farnham, 988 Saint Matthews Rd., Chester Springs, PA 19425. Checks should be made out to Skycastle French Hounds. If you’d like to share a memory and/or photo of Jim, please use the entry form on the top right corner of this page. All posts about Jim Scharnberg can be viewed here. Here are two photos of Jim in his element. Starting out at the enclosure at Aldie. I first met Jim on a very cold Sunday ten years ago after a foxhunting friend asked me if I would be going out with the Skycastle French Hounds the next day on the property adjoining mine. At that point I had been involved with foxhunting for just under 50 years, but had never gone out with a foot back, even though I was aware of footpacks. In fact, I had briefly met Jim’s predecessor Mrs. Streeter at her Skycastle Farm during an extra stop on a quest to buy a horse around 1970, but had no idea she was master of a footpack. Jim and Skycastle have provided me a way to continue to hunt with hounds for the past 10 years. Jim not only looked the part of a great master, he proved to be everything a master could be. Jim was great with the hounds; great with hunting; great leading the hunt. And he had an encyclopedic knowledge of the lore of hunting, and the people and the hounds involved with hunting over the years. When I visited Jim for the last time at Barclay Friends in early January 2019, we had an extensive conversation in which once again I learned quite a few things I had not known previously. I am grateful for the 10 years I knew Jim, grateful for the sport, and will miss him. Jim was a kind and wonderful person. I knew him best as talented and witty artist. His invitations for our fraternity alumni events were peerless and brought smiles to all who received them. He was an estraordinary talent. Are running yet, are hunting still. My aching lungs draw deep again. For yet a while as I run on. Their shapes stretch on beyond my ken.